So, I know I've been a slacker. I admit it. I pumped everyone up for my new blog and then didn't do anything except make the page pretty, for a month. I know. I'm sorry! So, this is me posting for the first time! I started an online job and learning the ins and outs has made me pretty busy. But enough of that. I've been wanting to make some cute little girl stuff for a while now. The only downside is that I don't have a little girl! So I am making this skirt for my friend K's little girl and will, eventually, hopefully one day soon make a matching bow tie for her baby boy! 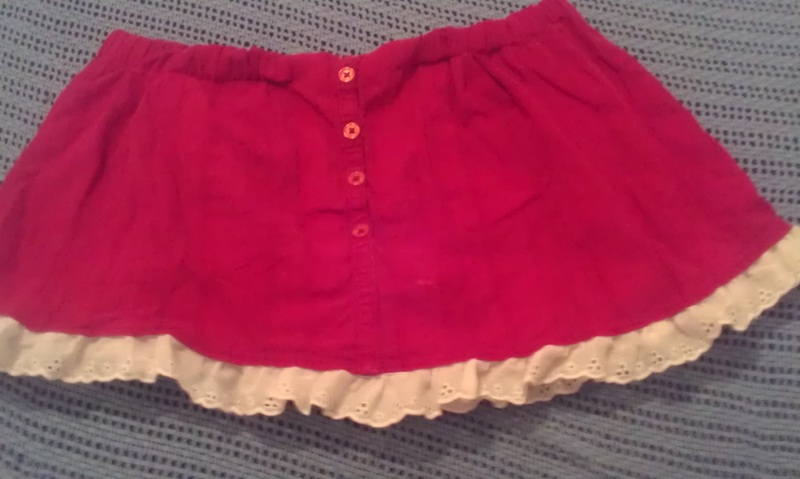 And turned it into a skirt like this!! I'm still not completely done but I'll run you through the steps. Sorry, I didn't take more pictures. I know I should have. I will next time! Step 1. Choose desire shirt and unpick seams. This one was good because it had a top section and a bottom section. Step 2: sew any seams back together that you may have mistakenly ripped out. 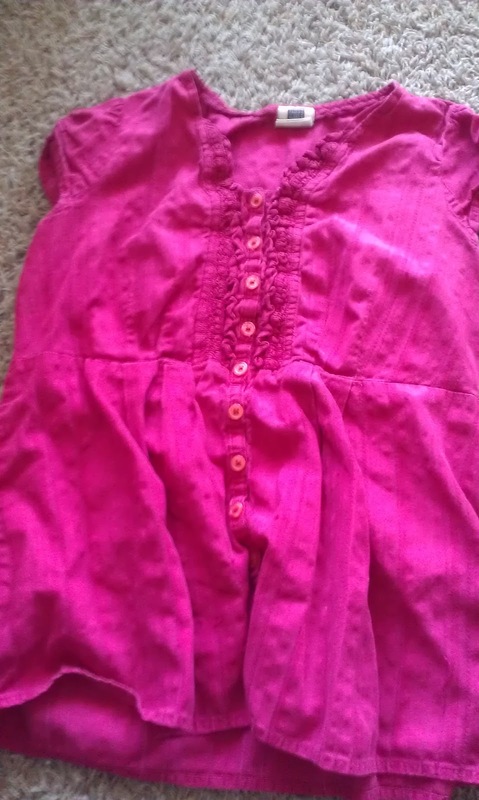 When I was ripping out along the edges, I accidentally ripped out some of the side seams so I sewed them up and sewed together the bottom of the skirt where the buttons end. 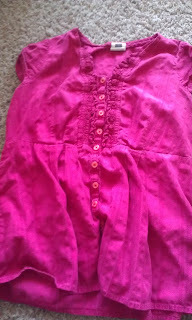 Step 3: Pin on ruffles/lace/rick rack if desired, and sew! My mom gave me all of this lace, and I am so happy! It was already ruffled so all I had to do was pin it onto the inside and sew right down the middle! Step 4: Make an elastic casing or sew on elastic. If your shirt is knit, you can sew an elastic right onto the inside without having to hem. Mine is not knit, but the top was already folded over about a 1/4 inch from the ripped seam. After I measured my elastic, I folded it over and pinned in place and sewed it shut. Don't sew it completely shut, however, because you need to be able to put the elastic inside of it. 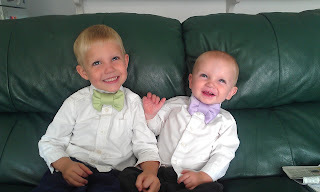 Next up for me is bow ties! My friend S. is having a baby boy so I'm making a few for her. I'll also make a bow tie from the rest of that pink shirt from above. Here are some that I already made modeled by my little studs. These are made from re-purposed ties that my husband no longer wears. The link for the tutorial can be found here. 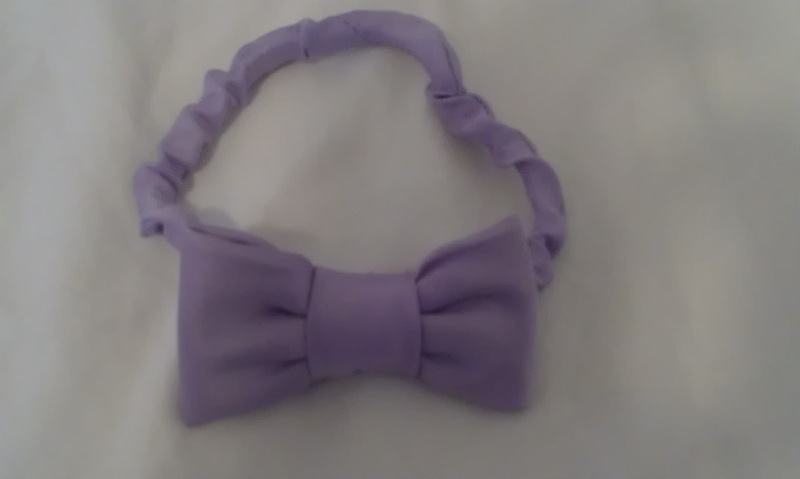 Since then, my bow ties are looking a lot better and less bulky. This one has an elastic neckband instead of a velcro one. My next one is sure to be even better! So stay tuned! Let me know how your little girl skirts go, if I have so inspired you to make one! Keep on Craftin'! And come back for more projects! I am excited!